Syracuse, N.Y. -- The United Way of Central New York is leaving its long-time home on James Street and moving four blocks up the street to WTVH's former television studios. President Nancy Kern Eaton said the nonprofit charitable fundraising organization will make the move from 518 James St. to 980 James St. sometime before its lease expires at the end of June next year. The organization will lease approximately 9,000 square feet of space on the first floor of WTVH's former building. That's a little less than the 11,500 square feet of space it has at 518 James St. Eaton said the organization's staff is smaller than it was years ago, so it does not need as much office space. She said the United Way found the former WTVH building appealing because it has space in the rear to store items donated to its Gifts in Kind program. The organization has 31 full- and part-time employees, 24 of which work out of its James Street office, she said. "We are excited to be moving to this new, reduced space that offers a terrific layout for more efficient operations," she said. "We are particularly pleased by the configuration of space available for our Gifts in Kind program." WTVH moved out of the 52,000-square-foot building, its home since 1962, in 2010, the year after the CBS affiliate merged its operations with NBC affiliate WSTM under joint sales and shared services agreements. WSTM, which is owned by Sinclair Broadcast Group, and WTVH now operate out of WSTM's offices just one block north at 1030 James St.
Real estate investor and restaurateur Lou Santaro purchased the former WTVH building in 2016 for $350,000 and has demolished many of its interior concrete block walls and removed asbestos in preparation for a major redevelopment. 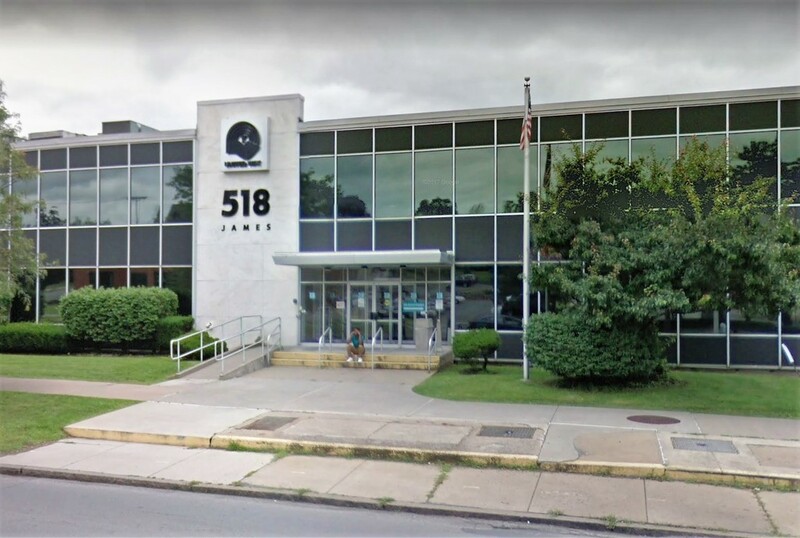 The United Way of Central New York plans to move from its offices at 518 James St. in Syracuse, above, to the former WTVH television building at 980 James St. in 2019. Planned renovations include all-new mechanicals, a video security system, installation of LED lighting, an elevator and new windows on the first and second floors, and new exterior landscaping. United Way will have signage on the building and on the existing monument sign at the front of the property. "When United Way moves in, everything will be new," said Jonathan Sayre, owner of The IBEX Group, the real estate brokerage representing Santaro in the transaction. NewVisions Communications Inc. is leasing a portion of the building's first floor. Following the build-out of United Way's space, the building will have approximately 20,000 square feet of space left for future tenants, he said. IBEX and The Pioneer Cos., which represented the United Way in the leasing agreement, donated their services to keep the organization's costs down. United Way raises approximately $6 million annually from donors and distributes it to more than 550 nonprofit charitable and human services organizations in Central New York.